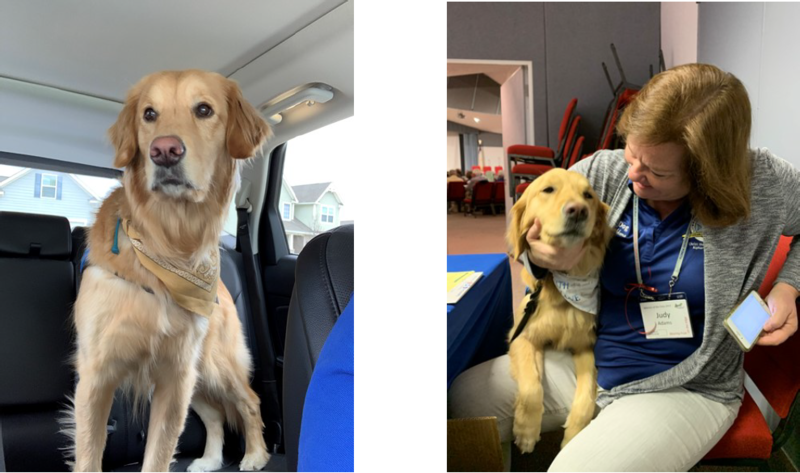 Elizabeth Comfort Dog is Trinity Lutheran Church's comfort dog to be the bridge to aid us in providing mercy, compassion, presence and proclamation of Jesus Christ to the community and people who are hurting or are in need of some comforting. When we take Lizzie out into the community the ministry team is also handing out her special business card. The card has some important information on it about Lizzie. The first thing most people see is Lizzie’s picture, then the LCC Logo, but the third largest item on the front of her card is her Bible verse. Every Comfort Dog in LCC has a unique Bible verse. Lizzie’s is Luke 1: 78-79 - Because of the tender mercy of our God, by which the Rising Sun from heaven will come to us, to shine on those living in darkness and in the shadow of death, to guide our feet into the path of peace. Our visits with Lizzie mirror that Bible message. We go out into the community because of God’s love for us and share the light of Christ. We visit a variety of places. We meet people who know Jesus as their Savior and those who don’t. What we have learned is that everyone needs to know more about Jesus, the Light of the World. Everyone needs to be reminded of God’s love for us. That love brings light into the dark places of our lives. Lizzie is the opening that gets us invited to share God’s love. Through planned Lizzie events and through everyday casual interactions in our neighborhoods, God guides our feet into the path of peace. On walks, at restaurants, running errands, and in our traveling, God leads us to people and leads people to us. Through the silent comfort Lizzie offers, we often hear people share about some darkness in their life and we have the opportunity to respond with God’s love through prayer, encouragement, and our presence. God uses even our most casual contacts to plant the seed. When we give hand out a Lizzie card, snap a picture and invite people to follow Lizzie on Facebook, we set up an opportunity to learn more about God and His love. Lizzie’s FB page is full of Scripture and encouragement. Often the seed of faith is tended by comments and other posts. What a blessing to have such a wonderful Gospel message to leave with those we visit. God loves us so much that He sent Jesus, the Rising Sun from heaven, to bring His light into our dark world of sin and suffering. we are empowered by the Holy Spirit to reach out with the Gospel of Jesus Christ to all. Copyright 2019 Trinity Lutheran Church - All Rights Reserved.